I have spent the afternoon researching small pet (rabbit and rodent) nutrition in my constant, obsessive quest to be a better veterinarian for my patients and veterinary resource for CareFRESH. Much of my reading today has circled back to laboratory animal nutrition resources. That is weighing heavily on me. It is difficult to read about research subjects when my frame of reference in Real Life centers around my own pets and the rodent patients who come in for individual, loving veterinary care, often in the hands of a child. In college I worked with the best teacher I have ever had, Dr. Merlyn Nielsen, a Professor of Animal Science at the University of Nebraska at Lincoln. His research interest at the time was primarily the heritability of obesity in mice. I loved helping Dr. Nielsen with his research and spending time with his super cute little white mice. 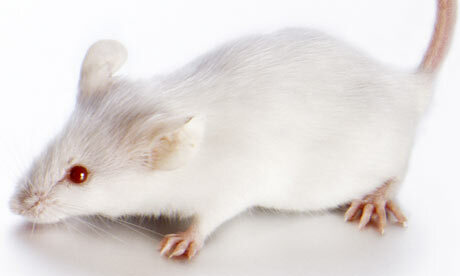 It took me thirty minutes to find a plain ol’ white lab mouse picture to contrast with the pet hamster picture, and I still think this guy is super cute! Fast-forward to senior year of vet school. I was finishing a well-rounded Midwestern veterinary education covering cattle, horses, pigs, cats and dogs, and realized no one had said “mice” to me in four years. So I headed down to the Lab Animal corner of the veterinary school and Dr. Lab Animal created an exotic pet rotation for me. We threw in a couple goat cases for fun. Again, a surprisingly wonderful experience. And again, I was shielded from terminal studies. Fast-forward um…many…years, and I LOVE my career as a small animal vet. I started in Littleton where lots of vets saw exotics, and ended up in Omaha, where I often get “You’ll see my hamster?? Woo! I will be right there!” which is almost more fun. Yeah, exotic pet loving vets are here, and they are awesome, but they are few and far between. I get quite a few referals from vets who only see dogs and cats and even from mixed animal practitioners (vets who see pets and large animals). Imagine the courage it takes a pet owner to ask that guy for a hamster referral! What if laboratory animal researchers and veterinarians who like exotic pets communicated? We don’t. We have entirely different goals and focuses. Pet practitioners are sad around research. It is difficult to wrap our heads around. Animals educated us so we could help other animals. We got through it and do not want to look back. Both of my experiences working with lab animals were very positive. Both leaders who taught me were kind-hearted, compassionate people who cared very much for the animals they oversaw. And SO MUCH research has been done over the years on animal health and nutrition and longevity. It has mainly been done to benefit people. Thank you researchers. Thank you animals. What if the knowledge from that research were also used to help pets? I joke that we should have more medical knowledge about guinea pigs than any other species, because they are…guinea pigs. But do we? And if so, is it all being accessed to its fullest potential? I think I have been ignoring a huge resource to the detriment of the patients under my care. I do not have a conclusion for this post because I do not know how it ends. When I figure out how to bridge the gap between the caretakers of the animals of the research world and the caretakers of the animals of the exotic pet world, I will share with you what I learn. This is just one tip of the lab animal iceberg, which, for me, is a very emotional topic. Chime in – I would love to hear your perspective. Sometimes the most emotionally exhausting journeys are also the most rewarding. This week I am looking back at my Riley and James posts and realizing that I have not posted an actual original, informative newsletter since October 3, 2010! And you are still here! Thank you! I will try to be more intentional about the exotic pets series that I started with Taking Care of Your Guinea Pig. Here is my lame excuse/exciting happenings this winter…I have been writing for several other sites and publications, which has been very rewarding. I am going to list them in the next posting, so you can look through them if you would like, but also so I can keep track of all of them, and what I am supposed to be working on now! Since it is so infrequent, I suspect that many of you are as insane as I am. If your hamster is sick, and if you have the means to treat her, you bring her to me as if she is a tiny little dog and say, “I know it’s crazy, but do whatever she needs.” I would contend that some sorts of crazy are good. My client list is as full of people who are as crazy as you and I, the good kind of crazy. And if you happen to be a sane person reading this, you now have been warned, and have the opportunity to find a rational, level-headed veterinarian. But you might as well read the stories. They are kind of fun. Recently, I had a baby Robo hamster as a patient. Herbie had just been snatched from the mouth of a cat and rushed to us. Her little hamster exam was normal except for a large tear in her skin where her scruff should be. Unfortunately, that is the handle of a hamster, and it was missing. She was a very sweet little hamster, but a bit of a pinball. As my receptionist Rhonda and I played the part of pinball paddles to keep her from jumping off the treatment table, Rhonda, following my shouted directions, (I’m not sure why I was shouting—she wasn’t a particularly loud hamster) aimed the surgical glue at Herbie and dripped a drop of glue right on a wound edge. I took the half-second window of frozen hamster confusion to pinch the wound edges together, before Herbie started pinballing again. I scooped her up to return the repaired hamster to her owner, when I realized her cute little round face fit perfectly in my closed fist, and she was now calm. In my defense, it was the end of a long day, and I have already told you that I am insane. I grabbed a Sharpie and drew little bunny ears and whiskers on my fist. If you have a friendly hamster, you have to try this! Anyway, I had not warned the client I was insane, so I switched her pet to my other hand, switched my face to serious doctor, put my Sharpie hand in my pocket and returned her very small hamster to her with her very small hamster medicine. The first veterinary hospital this client called would not see hamsters. Now look at what a great case they missed! Another recent hamster case involved a hamster who did not even have an owner yet. I include her in my hamster stories because I think pets have inherent worth, not just worth because we project it onto them. I was filling in at a different Banfield inside of a different Petsmart. I give you this background only to say, this Petsmart team is not used to my insanity. And I am used to Petsmart team members at my home Banfield perhaps rolling their eyes and saying “What’s this going to cost me?” but still handing over the hamster. Well, she did have surgery. All of the supplies were donated by that Banfield’s regular doctor, and I donated the surgery itself, and she was adopted by a different Petsmart employee at that store, a crazy one. What sane person would adopt a sickie and put herself through the heartbreak of losing her very soon after? I have a lot of respect for that second employee, and would have set myself up for the same heartbreak, if there had not already been a waiting list to adopt the hamster. I had a hamster patient with a severe open femoral fracture who needed his leg amputated. He is doing great a year later. I saw a hamster recently with the same history. He was running on his wheel and started limping. I had flashbacks to Amputation Hamster, but on examination, Joe had just injured a muscle and needed bed rest. I say that part, then the owners figure out how to talk the hamster into bed rest. They must have figured out how to explain it to Joe, because he also is doing well. Those are some of my best hamster stories. Now hopefully you know if you and I are a good client-doctor match. I will not be offended if you sneak off, keeping a wary eye on me the whole time. But I will be happier if you think, “If she cares that much about these little fluffs, she will probably understand why my dog is so important to me and take my concerns and the sanctity of our human-animal bond seriously.” But not as happy as I was when drew the bunny ears on the hamster and hopped her around my desk.